Over the next four days, Washington State left tackle Andre Dillard, quarterback Gardner Minshew, running back James Williams and more than 300 other pro hopefuls will dart through orange cones, press loaded barbells into the air and field questions from general managers as they aim to boost their stock before the NFL Draft, April 25-27. Based on NFL.com’s prospect grading system, the three Cougars have a great chance of finding their way onto an NFL roster. By most accounts, Dillard and Minshew are sure-fire draft picks who could hear their names called before day three. Williams, meanwhile, has a big opportunity to show scouts why his skill set should be valued at the next level after leaving college a year early. On Thursday, Dillard, Williams and the other offensive linemen and running backs went through psychological testing, an NFL Players Association meeting, media availability, the bench-press test and interviews. Their on-field workouts will take place Friday at Lucas Oil Stadium in Indianapolis. Minshew and the quarterbacks will have their on-field testing Saturday after going through interviews and psychological tests Friday. Here’s a combine primer on the three WSU players, and a brief look at what they’ll need to show NFL teams this weekend. Most of what scouts wanted to see of WSU’s All-American left tackle was on display for a week last month in Mobile, Alabama. Like every Air Raid offensive lineman who came before him, Dillard has to show teams he can adapt to playing in a more run-oriented offense that aligns its linemen closer together, as opposed to the wide O-line splits he was accustomed to in Pullman. Dillard has been training with the respected Rep1 Sports team in Irvine, California, and it’s hard to imagine him sputtering anywhere at the combine. Once a 230-pound high school basketball player, Dillard always has had solid footwork, strong lateral movement and great athleticism for his position, so drills involving cones and vertical leaps shouldn’t be much of a challenge. After a Senior Bowl practice, he told NFL Network in an interview he expects to clock a sub-5-second 40-yard dash – something only 10 O-linemen have done in the past three combines. For someone who lets his play do most of the talking, actually speaking – to general managers, scouts, reporters – might be the most uncomfortable part of the next few days for Dillard. WSU’s left tackle hasn’t always been fond of media attention and hasn’t experienced much of it playing his college football in one of the country’s smallest Power Five markets. Dillard got a small taste of that at the Senior Bowl, talking to just about every NFL team in attendance, but the series of interviews and media encounters he’ll have at the combine will be much more time-consuming. Minshew, on the other hand, thrives whenever there’s a microphone in front of him. The more opportunities the quarterback has to give scouts and GMs a glimpse of his charisma and outgoing personality, the better. If Minshew sneaks into the top four rounds of the draft, it’s likely because someone is placing high value on his intangibles – the work ethic, vocal leadership and genial persona that made him a star for one season in Pullman. It’s also a significant opportunity for Minshew to show scouts he’s more than that. 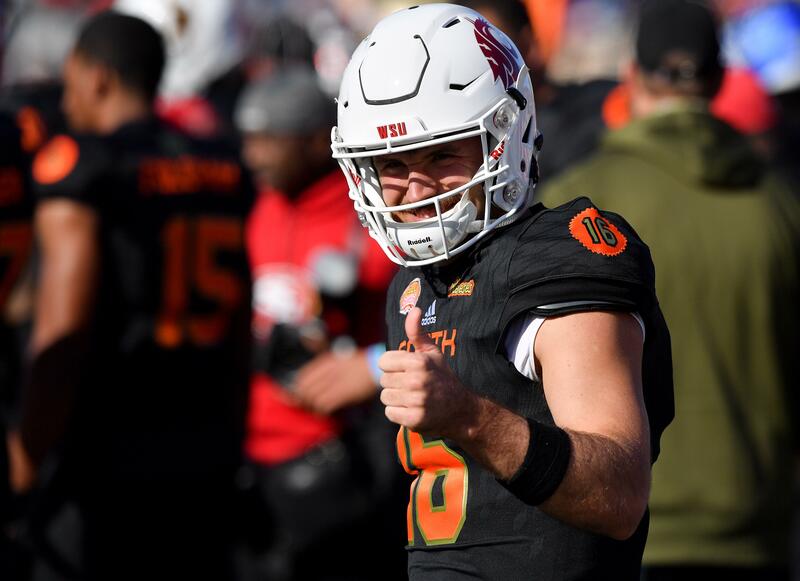 While he left the Senior Bowl feeling good about his body of work for the week, Minshew was critical of his performance in the game after completing just 1 of 8 passes for 4 yards. So if there’s anything Minshew should zero in on this week – this probably holds true for every QB in attendance – it’s the throwing drills. The graduate transfer who came to WSU after stops at Troy, Northwest Mississippi Community College and East Carolina is much more accurate than he showed in the Senior Bowl, and probably has a slightly stronger arm than predecessor Luke Falk, who was only average during the on-field portion of last year’s combine. Minshew threw plenty of short screens and dump-offs in college, so if he can put some zip on his intermediate passes and display some touch on his longer ones, it could help his draft stock. Every second of this combine will be pivotal for Williams, who wasn’t a shoo-in to be invited in the first place and didn’t have an opportunity to prove himself at a college all-star game like Dillard and Minshew. Williams’ Pro Day in Pullman will be crucial, too, but he won’t have more exposure than this week in Indianapolis. NFL already scouts know how versatile the WSU running back is, and the combine’s drills seem to be tailor-made for someone who’s fantastic in small spaces. Williams spent enough time hurdling tacklers at the collegiate level that it’s easy to imagine him performing well in the broad and vertical jumps. While he’s great in short bursts, Williams didn’t have many long runs in college – largely because of how defenses schemed against the Air Raid, often dropping eight men back into coverage. Few know how quickly the running back can cover 40 yards. That will be an important test for Williams, as will the bench press. The better he performs in media settings and closed-door meetings with NFL teams, who still don’t know a lot about the Burbank, California, native, the more likely Williams goes from a fringe draft prospect to a day-three lock. Published: Feb. 28, 2019, 12:23 p.m. Updated: Feb. 28, 2019, 5:27 p.m.